There is mounting evidence that our thoughts have an effect on how well or poorly we age. A study conducted in 1996 had two groups of people solving anagrams. In one group, the words were age-stereotype terms like “forgetful” and in the other group, the words were neutral and not age related. After the two groups solved the word puzzles, they were dismissed and the researchers timed their walking pace as they moved down the hall. Those who had been exposed to the negative stereotype words walked more slowly than the people in the other group. In 2008, a study had people sorting photographs. One group was instructed to divide them into “old” and “young” while other groups sorted the photos by gender or other non-age-related categories. Again, the walking pace of participants was measured afterward and those who had focused on old vs. young had a slower walking pace afterward. A Yale study in 2014 showed older adults images on a computer screen. Some were shown images with words like “creative” rapidly flashing so they only registered subconsciously or subliminally. Others were shown negative age stereotype words. The group that was exposed to the positive messaging showed improved balance. The positive thoughts associated with aging were found to “improve older adults’ physical functioning outcomes over time” as reported in the January-February 2015 issue of AgingToday, a publication of the American Society on Aging. The impact of stereotypes we accept can affect not just our physical abilities. 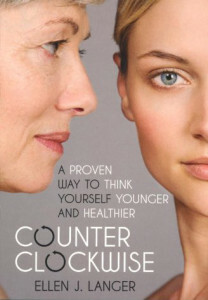 Ellen Langer, the Harvard researcher and author of Counterclockwise, has conducted numerous studies on the impact of attitudes and beliefs on aging. In one, she and Becca Levy tested the influence stereotypes have on memory loss. Participants who did not think of memory loss as a natural part of being old were found to experience less of it. What we think, expect, and believe can shape the way we age. If we don’t blindly accept that our balance or ability to walk well or memory will get worse, perhaps there’s a chance they may not. It might be useful to stop and pay attention to our thoughts, expectations, and beliefs to see if they could be working against us instead of empowering us.